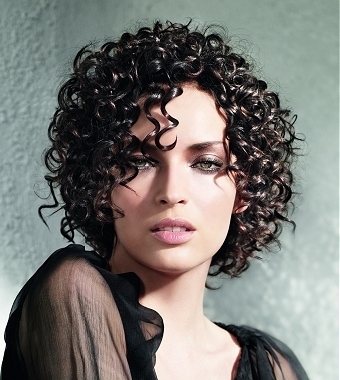 Luscious Medium Curly Hair Styles. Nowadays that hair stylists came up with a huge list of revolutionary hair styling tools and products, curly hair is no longer a burden. The luscious medium curly hair styles offer you endless alternatives to sport your sleek or naturally curly hair into fashionable ways. Turn your ringlets into fabulous accessories of your brand new and updated look. Choose the right length and hair cutting design to feel confident in your skin. Revive your lifeless curls with the most cutting-edge medium curly hair styles that flash the beauty of your hair texture and can also furnish your features with the perfect frame to accentuate their uniqueness. Often natural curls can become deflated, in this case all you have to do is change your haircut and additionally complete your hair styling kit with the high quality products and formula that moisturize and condition your locks. There's no need to panic when you struggle with frizz as hair pros grant you with the privilege of sporting looks that are 100% frizz- and breakage-proof. Quit exposing your strands to the bad hair days and other damages. 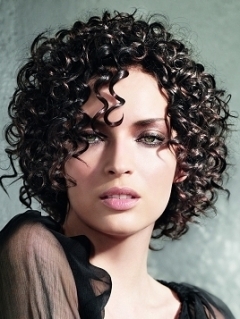 Look out for the most luscious medium curly hair styles that cheer up both casual as well as formal appearances. One of the basic conditions to master these high brow hair styles is indeed to keep your curls smooth with the proper curly hair care products available on the market. Indeed, loose curls create a Romantic and retro-inspired allure to your apparel, use curling irons to create them if you are the owner of sleek or simply wavy tresses. On the other hand, those who were blessed with tight corkscrews can also pull off this sensual and dazzling trend with the help of natural relaxer methods as well as professional products. Find the best alternatives that suit your hair type as well as budget and make the best option for the sake of your hair. Choose a groovy hair part and separate the strands in two sections at least in order to establish the best conditions for proper hair styling. Use the curling iron or tong to the hair ends or for a more girlie and classy look start at the roots. These will add definition and depth to your hair. Tousled as well as perfectly tamed looks are popular during the season and can make you the main attraction of the day. Use shine serum to secure the long-lasting shine and softness of your hair style as well as a breezy and smooth movement. Tighter and more luscious curly hair styles rival the popularity and glam of Poker-straight hair due to their all-face-shape flattering quality as well as their ability to add a brand new vibe to medium locks. Those who long for luxe ringlets can go for the hair styles above that will turn you into a real Glam diva crowning the atmosphere of a stylish party. Indeed, these hair styles are far from being natural- and low-maintenance-looking, therefore professionals highly recommend to keep them as the best alternatives for formal and more ceremonial events. Glam your strands up for the night or evening cocktail party and let the locks follow a well-defined pattern when styling your hair with hot rollers or a pro curling iron. Proceed by sections especially if you have thick and an already curly textured hair. Sport your oh-so-luxe spiral curls or permed hairdo with additional accessories if you wish. Bring out the best of your new look with the help of texturising pastes as well as hair spray that keep your strands in the desired and flamboyant shape.